I woke up this morning exhausted, even though my Fitbit said I had slept over seven hours. The past few weeks have been extremely tiring, and I’ve gotten worn down, unable to get enough sleep to recharge my batteries. Normally, I’m an optimistic person, and I can see magic all around me as I go through my day. But, when I feel like this, it’s as if the magic has died and the colors fade to gray. My poor husband and Toby get snapped at no matter what they do, which is totally unfair but almost beyond my control. Then last night the weatherman said Tropical Storm Harvey was headed right at us, and it was going to flood the whole area. Great! Now we are under a tropical storm watch, and it is expected to hit within 48 hours. We aren’t likely to flood here, but if it knocks the power off for a week or more, then we will lose all the food in the freezers, the water well and toilets won’t work, etc., etc. This was just more than I could handle this morning. I needed a vacation. Of course, I don’t have time for a literal vacation – there’s a tropical storm coming – but I do have time for a virtual vacation. Join me, let’s de-stress together. Years ago, before my husband’s stroke and resulting blindness, we took a vacation to Lake Tahoe. He enjoyed playing poker and was looking forward to spending time in the casino. At first, I thought I would spend a lot of time reading in our hotel room, but I was in for a surprise. It was October, and the day after we arrived they had their first snow fall of the year. My husband was so entranced by the beauty and the opportunity to take pictures he left the casino and joined me in exploring. It was wonderful. 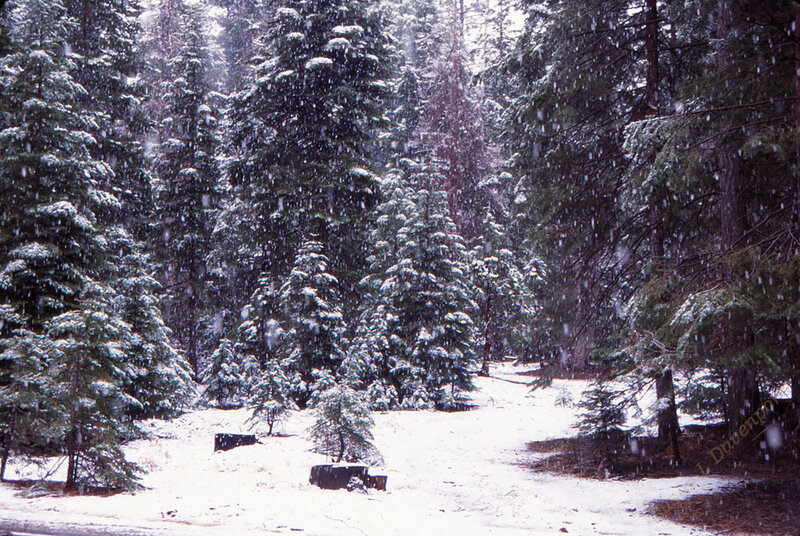 We started up into the mountains and found ourselves in the middle of the forest in a snow storm. It was so still and quiet, even the animals had hunkered down. The only sounds I remember are the swish of the large snowflakes as they fell and the crunch of the snow as we walked across it. My husband, Paul, had driven in Germany while he was a courier for the Army, so he wasn’t intimidated by the snow. He drove us up this steep road with signs saying only cars with chains or four-wheel-drive should proceed (yes, our rental car was four-wheel-drive), and we ended up at the top of the mountain. The road was built on the ridge of the mountain with a drop-off on each side. To be on the ridge of a mountain in the middle of a blizzard was frightening for me, but not for Paul. The excitement was dancing out of his eyes, and a huge grin stretched from ear to ear. He was in his element. After we crossed the ridge, we found a park and pulled off to take pictures. The snowflakes were bigger and coming down faster. The air was so crisp and clean. I could breathe easily and completely fill my lungs. I loved it. I would have bottled it and brought it home with me if it were possible. The next day, the weather cleared. We got out to see the sights after the storm and found a rocky beach on the side of the lake. Lake Tahoe is huge, especially when you consider that its only water source is snow melt. No streams going into or out of the lake. Because of that, the people that live there are very careful about pollution and conservation. We took a dinner cruise on a steamboat around the lake, and they explained the restrictions placed on boating, and how they were designed to protect their water source. On one of our treks, we discovered a visitor's center and the ranger in charge told us about this little-used road to a beautiful vista. It was remote, and we found ourselves following the tracks of one other vehicle through the snow up the side of the mountain. We couldn’t see a road, just that set of tracks that led between the trees. It sounds like a crazy thing to do as I look back on it, but sometimes you have to step out of your comfort zone to gain a great reward. We ended up on the top of another mountain ridge, looking down into a valley. Yes, it was a little scary because if I stepped too far in either direction off the road, I would have fallen down the side of the mountain, probably as a big snowball by the time I reached the bottom. But it was worth it. That was an amazing experience. We had a wonderful vacation. Paul got to play his poker in the evenings after dark, and I got to read my book, but what we will always remember about that vacation to Lake Tahoe is the beauty of the environment and the friendly people. I’ve learned a powerful lesson today. We all have stresses in our life, and sometimes we need a break. It can get depressing when we know we need a vacation, but we can’t take one – not enough money, not enough time – there’s an endless list of reasons. But a virtual vacation is cheap and quick. By using the power of our minds, our memories, and either our own photographs or someone else’s, we can have our break. I feel so much better now – how about you? What vacations do you remember fondly? When you’ve had a hard day, and your stress levels are high, get your pictures out and remember the fun you had and relive it. There is power in taking a vacation – even a virtual one. Have a great time.